The weathers been interesting for the last few weeks! 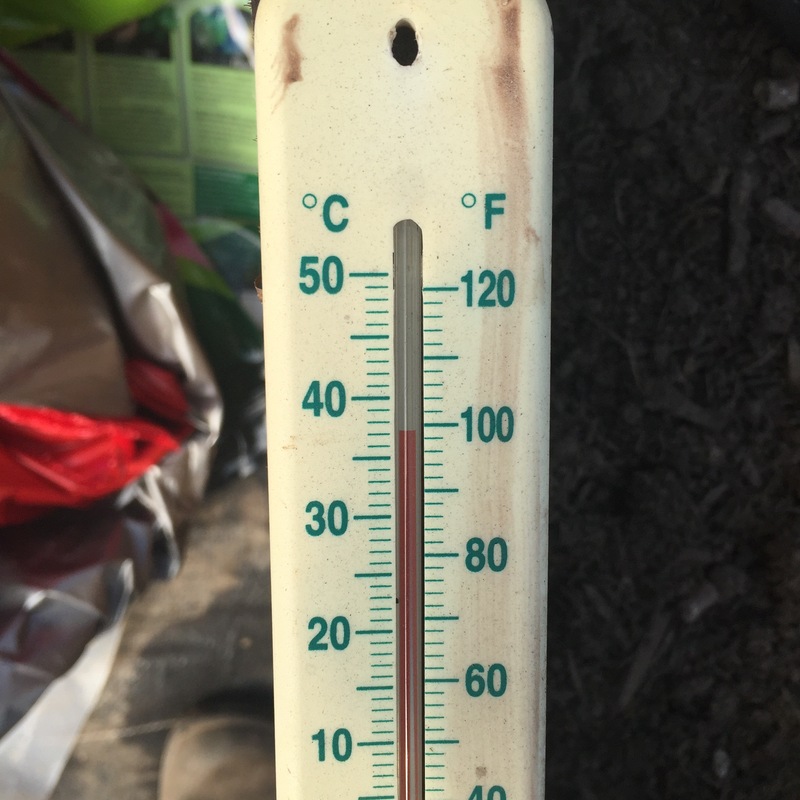 It’s been frosty at night, yet up to 18 degrees in the day on my plot. 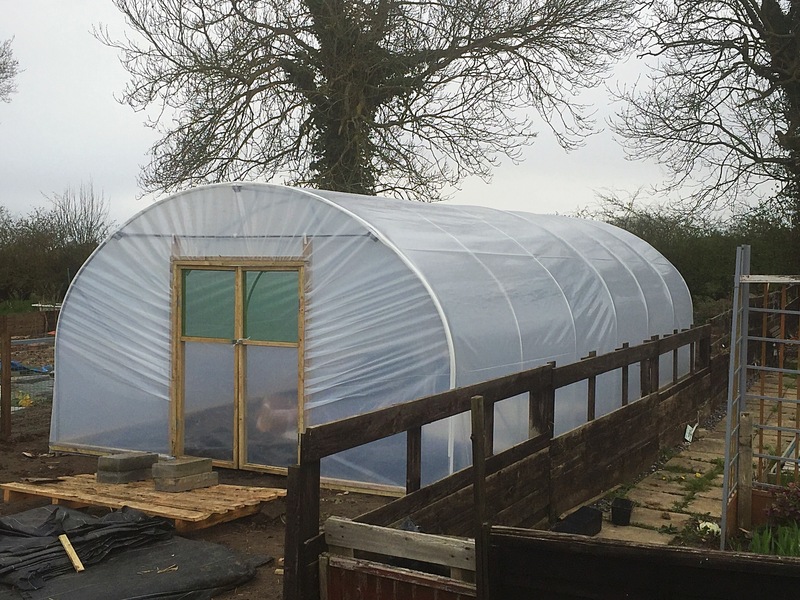 I’ve finally managed to finish the poly tunnel and make 2 large raised beds. 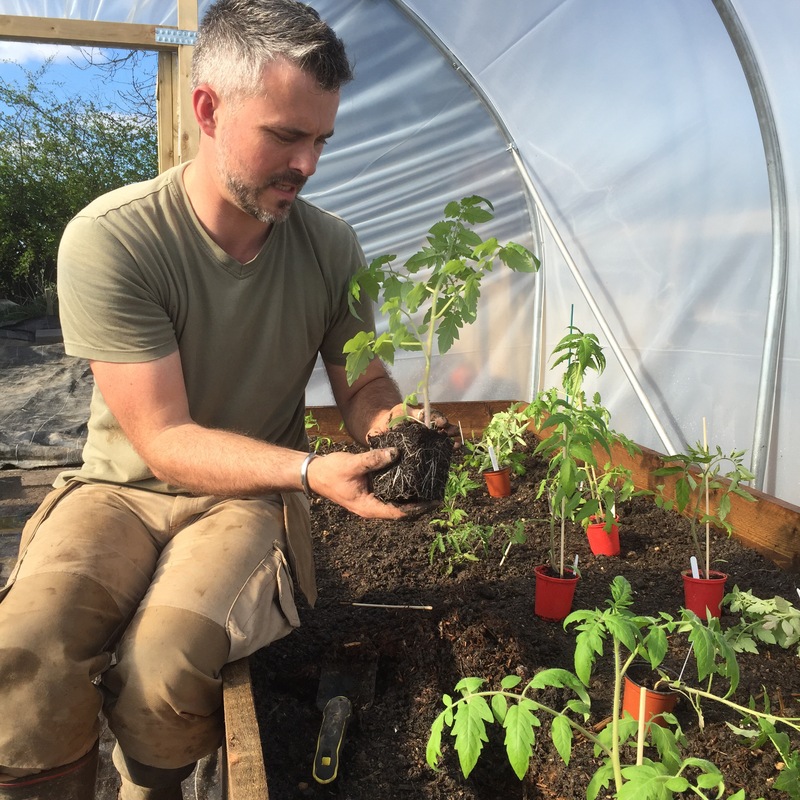 I decided that I wanted to put my tomatoes into the tunnel as soon as I could, so I had a go at making a hot bed. These were really popular in Victorian times, when they didn’t have power to heat their class houses. 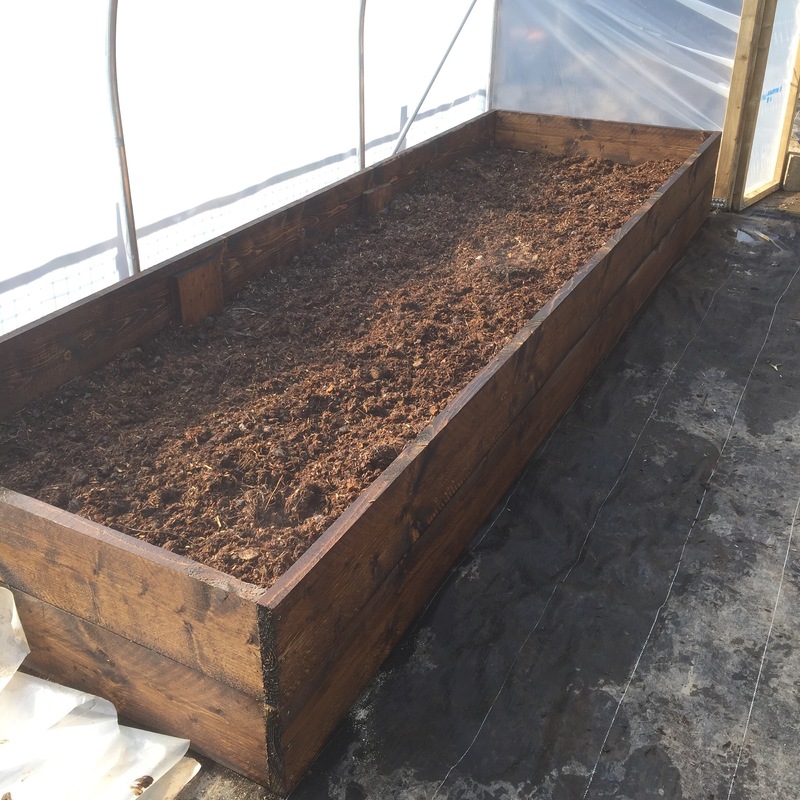 It involves adding a layer or manure to the bottom of the beds. It’s not fresh, but it is still producing heat from rotting down. I then added rotted, manure with lots of straw. This keeps the heat in the beds, while the top level is top soil, ready to plant your tomatoes into. It stays warm in the tunnel in the day, in fact the temperature has got up to almost 40 degrees. Then the warmth from the manure helps keep the tunnel frost free and warm at night. Not bad for mid April. So I must remember to keep the doors open in the summer, or I’ll cook my plants! Some of the rare heritage tomatoes have gone in the tunnel already. I’m just waiting for the last few to get a little bigger before I put them in too. The names are a secret, as I want to see how everything grows and surprise you with some of the fantastic varieties I’m growing later in the year. Hopefully, the best ones will be in my seed range next year for you to grow yourself. I’ve tried a method of growing tomatoes called ‘trenching’. You can google it for more details, but it’s very popular in the states for tomatoes that are grown outside. It allows more root growth and you can train 2 leading shoots from one plant. I’m trialling it to see how it affects root growth. 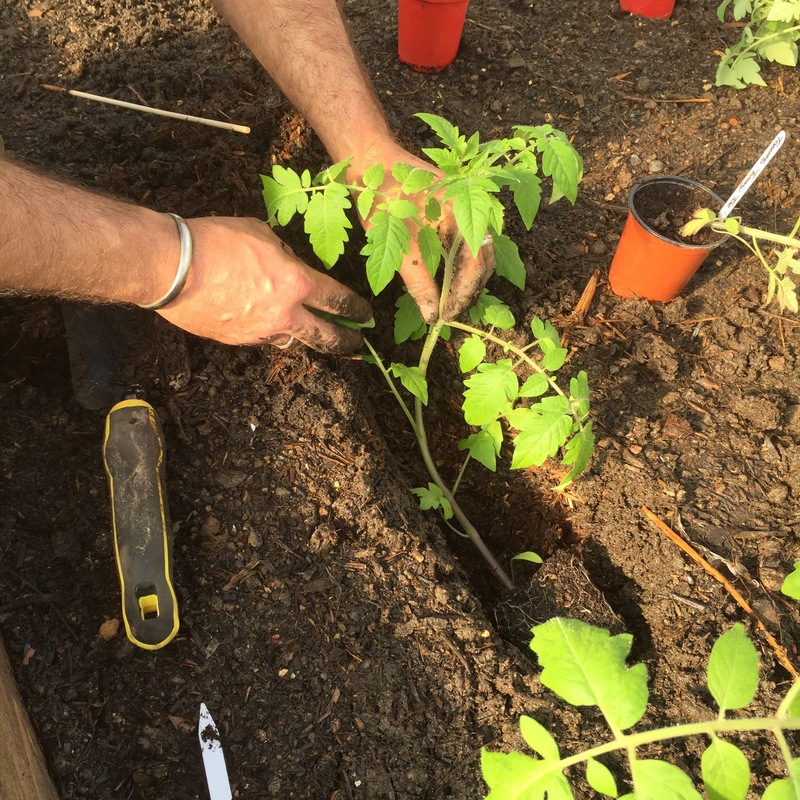 It’s also a great way to deal with leggy plants, simply dig a trench as deep as you would for your plant normally. Then lay 70% of the plant in the trench, with 30% sticking out of one end. Put a cane in by the exposed end and refill the trench. Simple. 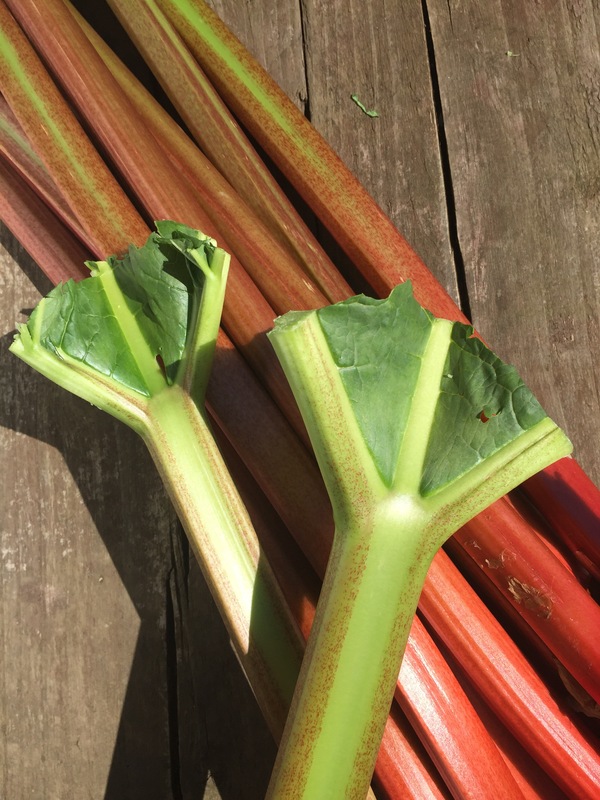 For the past month I’ve been picking rhubarb and ‘Timperly Early ‘is really living up to its name. It produces lots of gorgeous, thick stalks. A handy hint is to leave a small bit of leaf on the top of the stalk when you harvest it. This helps keep the stalks from going floppy before you can get them home and in the fridge (if you aren’t cooking them straight away). The asparagus crowns I ordered had arrived a few days ago. It’s one of those crops I’ve always wanted to grow, as both Matt and myself love it! Before planting, make sure to soak the crowns for a few hours. Then, to plant them out, make a trench a spade wide and almost a spade deep. Next, mound some soil up in the bottom of the trench, all the way along (like earthing up potatoes). This mound is for your asparagus crowns to sit on. 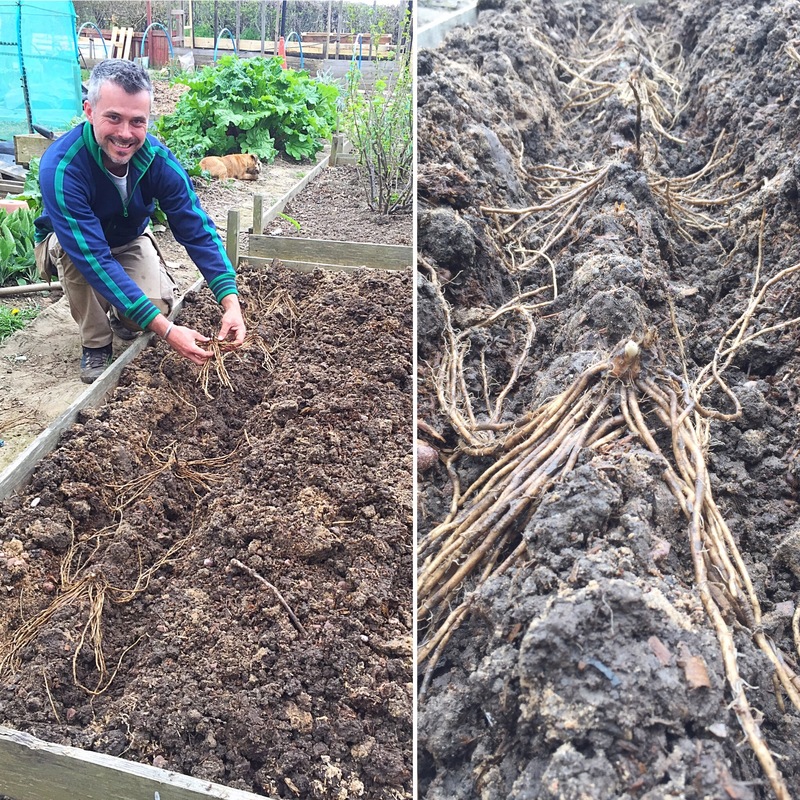 Lay the roots down the side of the mound and backfill with soil. This keeps the crowns dry in wet weather. Remember not to harvest any asparagus from the plants this year, and only a couple of spears next year. Year 3 is the year when you can gather as many as you like. The crown will be strong enough to survive by then. Even though asparagus are perennial and will come back for years, they appreciate being weed free throughout the year. Be careful when hoeing as you can damage the roots, that’s why I prefer to hand weed. 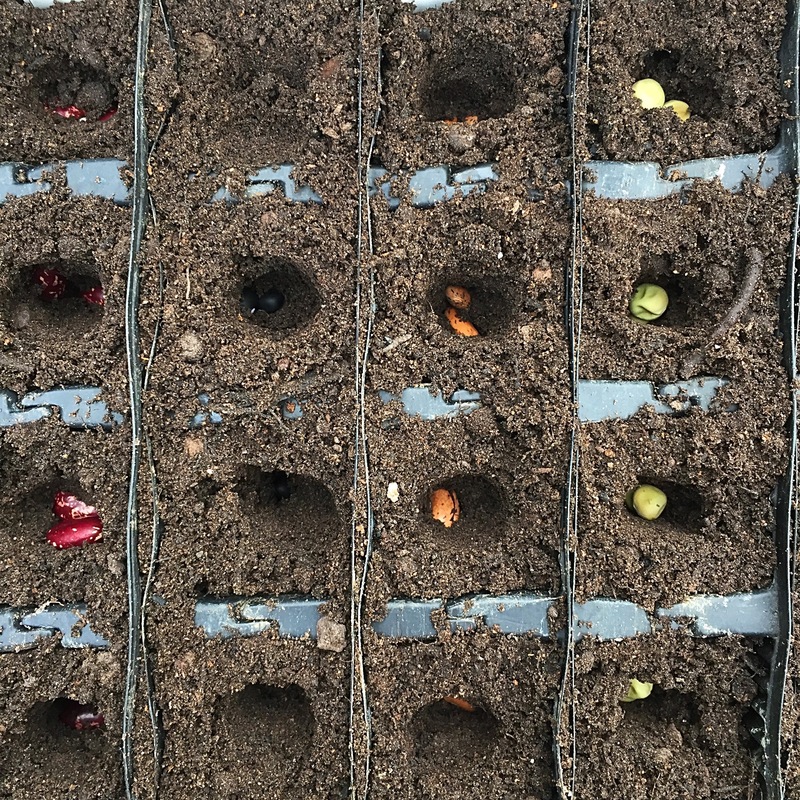 I’ve also sown carrots, radish, beans, peas and beetroot this week. Plus I’ve planted dahlias, ranunculus and anemone and bee balm.